Cast your contents (Video, Game, Audio, Picture, App and File) in your Smart Phones / Tablet PC to another big screen devices with HDMI interface (such as, HDTV, Monitor & Projector, etc) by using Miracast, DLNA and AirPlay through WiFi connection. Perfectly to enjoy the ultimate big screen: Watch movies, play games, create your own exclusive cinema. Allows you to enjoy different audio-visual feast! Built-in Wi-Fi module supports 2.4GHz WiFi, supporting Online & Local content wireless display: Video / Audio / Photo / Office file / Website. Also can be used a Car WiFi Display and a great Travel Partner, just connect M2 Plus (powered by 5V/1A) to Car HDMI port, transmitting multimedia contents of Smart Phones to the car monitor. Traffic jam time is no longer boring. HDMI port (HDMI1.2) support 1080P video output and High-quality Sound Effect output. Note 1:The WiFi Wireless Display Receiver uses Miracast standard Protocol. Due to the Netflix and YouTube videos which are encrypted, the product will cannot achieve the function of projecting your Smart Phones / Tablet PC to another big screen devices. Note 3: The WiFi Wireless Display is only compatible with Smartphone and Tablet PC. Note 4: The WiFi Wireless Display Receiver is not compatible with Youtobe, Netflix, Amazon Video Client. It only supports web version. 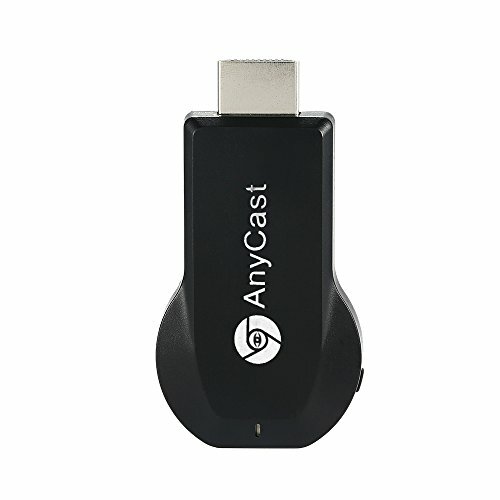 AnyCast M2 Plus WiFi Display Receiver is a Special Devices to project your Smart Phones / Tablet PC to another big screen devices with HDMI interface (such as, HDTV, Monitor & Projector, etc) through WiFi connection. It supports popular ScreenShare standards, such as, Miracast, DLNA and Airplay, can enhance your HDTV / Projector / Monitor with HDMI input socket. The WiFi Display Receiver has more features such as, streaming video, web surfing, photo viewer, Internet video and more, just to enjoy excellent multi-display sharing. The WiFi Wireless Display is only compatible with Smartphone and Tablet PC. If you have any questions about this product by ENJOY-UNIQUE, contact us by completing and submitting the form below. If you are looking for a specif part number, please include it with your message.